Sawdust or wood dust is a by-product or waste product of woodworking operations such as sawing, milling, planing, routing, drilling and sanding. It is composed of fine particles of wood. These operations can be performed by woodworking machinery, portable power tools or by use of hand tools. Wood dust is also the byproduct of certain animals, birds and insects which live in wood, such as the woodpecker and carpenter ant. In some manufacturing industries it can be a significant fire hazard and source of occupational dust exposure. Sawdust is the main component of particleboard. Wood dust is a form of particulate matter, or particulates. Research on wood dust health hazards comes within the field of occupational health science, and study of wood dust control comes within the field of indoor air quality engineering. Two waste products, dust and chips, form at the working surface during woodworking operations such as sawing, milling and sanding. These operations both shatter lignified wood cells and break out whole cells and groups of cells. Shattering of wood cells creates dust, while breaking out of whole groups of wood cells creates chips. The more cell-shattering that occurs, the finer the dust particles that are produced. For example, sawing and milling are mixed cell shattering and chip forming processes, whereas sanding is almost exclusively cell shattering. A major use of sawdust is for particleboard; coarse sawdust may be used for wood pulp. Sawdust has a variety of other practical uses, including serving as a mulch, as an alternative to clay cat litter, or as a fuel. Until the advent of refrigeration, it was often used in icehouses to keep ice frozen during the summer. It has been used in artistic displays, and as scatter in miniature railroad and other models. It is also sometimes used to soak up liquid spills, allowing the spill to be easily collected or swept aside. As such, it was formerly common on barroom floors. It is used to make Cutler's resin. Mixed with water and frozen, it forms pykrete, a slow-melting, much stronger form of ice. When cereals were scarce, sawdust was sometimes an ingredient in Kommissbrot. Auschwitz concentration camp survivor, Dr. Miklós Nyiszli, reports in Auschwitz: A Doctor's Eyewitness Account that the subaltern medical staff, who served Dr. Josef Mengele, subsisted on "bread made from wild chestnuts sprinkled with sawdust." Breathing airborne wood dust may cause allergic respiratory symptoms, mucosal and non-allergic respiratory symptoms, and cancer. In the USA, lists of carcinogenic factors are published by the American Conference of Governmental Industrial Hygienists (ACGIH), the Occupational Safety and Health Administration (OSHA), and the National Institute for Occupational Safety and Health (NIOSH). All these organisations recognize wood dust as carcinogenic in relation to the nasal cavities and paranasal sinuses. People can be exposed to wood dust in the workplace by breathing it in, skin contact, or eye contact. The Occupational Safety and Health Administration (OSHA) has set the legal limit (permissible exposure limit) for wood dust exposure in the workplace as 15 mg/m3 total exposure and 5 mg/m3 respiratory exposure over an 8-hour workday. The National Institute for Occupational Safety and Health (NIOSH) has set a recommended exposure limit (REL) of 1 mg/m3 over an 8-hour workday. As with all airborne particulates, wood dust particle sizes are classified with regard to effect on the human respiratory system. For this classification, the unit for measurement of particle sizes is the micrometre or micron (μm), where 1 micrometre = 1 micron. Particles below 50 μm are not normally visible to the naked human eye. Particles of concern for human respiratory health are those <100 μm (where the symbol < means ‘less than’). Particles which precipitate in the vicinity of the mouth and eyes, and get into the organism, are defined as the inhalable fraction, that is total dust. Smaller fractions, penetrating into the non-cartilage respiratory tract, are defined as respirable dust. Dust emitted in the wood industry is characterized by the dimensional disintegration of particles up to 5 μm, and that is why they precipitate mostly in the nasal cavity, increasing the risk of cancer of the upper respiratory tract. A study to estimate occupational exposure to inhalable wood dust by country, industry, the level of exposure and type of wood dust in 25 member states of the European Union (EU-25) found that in 2000–2003, about 3.6 million workers (2.0% of the employed EU-25 population) were occupationally exposed to inhalable wood dust. The highest exposure levels were estimated to occur in the construction sector and furniture industry. Wood dust is known to be a human carcinogen, based on sufficient evidence of carcinogenicity from studies in humans. It has been demonstrated through human epidemiologic studies that exposure to wood dust increases the occurrence of cancer of the nose (nasal cavities and paranasal sinuses). An association of wood dust exposure and cancers of the nose has been observed in numerous case reports, cohort studies, and case control studies specifically addressing nasal cancer. To lower the concentration of airborne dust concentrations during woodworking, dust extraction systems are used. These can be divided into two types. The first are local exhaust ventilation systems, the second are room ventilation systems. Use of personal respirators, a form of personal protective equipment, can also isolate workers from dust. These rely on air pulled with a suction force through piping systems from the point of dust formation to a waste disposal unit. LEV systems consist of four elements: dust hoods at the point of dust formation, ventilation ducts, an air cleaning device (waste separator or dust collector) and an air moving device (a fan, otherwise known as an impeller). The air, containing dust and chips from the woodworking operation, is sucked by an impeller. The impeller is usually built into, or placed close to, the waste disposal unit, or dust collector. Guidelines of performance for woodworking LEV systems exist, and these tie into occupational air quality regulations that exist in many countries. The LEV guidelines often referred to are those set by the ACIAH. Low-volume/high-velocity capture systems are a specialised type of LEV that use an extractor hood designed as an integral part of the tool or positioned very close to the operating point of the cutting tool. The hood is designed to provide high capture velocities, often greater than 50 m/s (10,000 fpm) at the contaminant release point. This high velocity is accompanied by airflows often less than 0.02m3/s (50 cfm) resulting from the small face area of the hood that is used. These systems have come into favour for portable power tools, although adoption of the technology is not widespread. Festool is one manufacturer of portable power tools using LVHV ventilation integrated into the tool design. If suitably designed, general ventilation can also be used as a control of airborne dust. General ventilation can often help reduce skin and clothing contamination, and dust deposition on surfaces. Within industry, many countries have air quality regulations. This is to help ensure that wood dust is extracted to a level that ensures specified maximum allowable residual airborne dust concentrations and worker exposure levels. ^ IARC 1995. Wood Dust. In IARC Monographs on the Evaluation of Carcinogenic Risks to Humans. Volume 62: Wood Dust and Formaldehyde. Lyon, France: World Health Organization International Agency for Research on Cancer, p.70. ^ Felman, David (2005) "Why Did Bars Used to Put Sawdust on the Floor? Why Don't They Anymore?" Why Do Elephant's Jump? HarperCollins, New York, page 118, ISBN 978-0-06-053914-6, quoting Christopher Halleron, bartender and beer columnist. ^ Nassauer, Sarah (4 May 2011). "Why Wood Pulp Makes Ice Cream Creamier". The Wall Street Journal. ^ Packing houses formerly purchased large quantities of sawdust for the cutting room floors, and still purchase sawdust for use as a fuel and flavoring in the smoking process. ^ Savic, I. V. (1985). "Small-scale sausage production: Sausage Casings". Rome: Food and Agriculture Organization of the United Nations (FAO). ^ "Bread Labels on Wood Fiber Draw Attack". Los Angeles Times. 9 October 1985. Archived from the original on 16 September 2010. ^ Nyiszli, Miklos (2011). "3". Auschwitz: A Doctor's Eyewitness Account. New York: Arcade Publishing. p. 34. ^ "Wood Dust Exposure". State Compensation Insurance Fund. Archived from the original on May 4, 2012. Retrieved April 30, 2012. 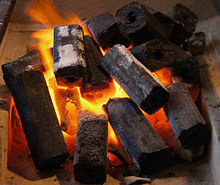 ^ "Report on Carcinogens, Twelfth Edition, Wood Dust" (PDF). Archived from the original (PDF) on February 17, 2013. Retrieved July 12, 2014. ^ "FINAL Report on Carcinogens Background Document for Wood Dust" (PDF). Retrieved July 12, 2014. ^ Meier, Eric. "Wood Allergies and Toxicity". The Wood Database. ^ United Startes Department of Labor: Occupational Safety and Health Administration. Wood Dust. ^ Baran, S., & Teul, I. 2007. Wood Dust: An Occupational Hazard Which Increases the Risk of Respiratory Disease. Journal of Physiology and Pharmacology 58, Suppl. 5, pp.43-50. ^ "CDC - NIOSH Pocket Guide to Chemical Hazards - Wood dust". www.cdc.gov. Retrieved 2015-11-28. ^ IARC 1995. IARC Monographs on the Evaluation of Carcinogenic Risks to Humans. Volume 62: Wood Dust and Formaldehyde. Lyon, France: World Health Organization International Agency for Research on Cancer, p.66. ^ Kaupinnen, T., et.al. 2006 Occupational Exposure to Inhalable Wood Dust in the Member States of the European Union. Ann Occup Hyg (2006) 50 (6): 549-561. ^ WHO, 1999. Hazard Prevention and Control in the Work Environment: Airborne Dust. WHO/SDE/OEH/99.14. Geneva: World Health Organization, Department of Protection of the Human Environment, Occupational and Environmental Health. p.98. WHO 2005. Air Quality Guidelines for Europe, 2nd ed. WHO regional publications. European series, No. 91. Copenhagen: WHO Regional Office for Europe. Wikimedia Commons has media related to Sawdust.